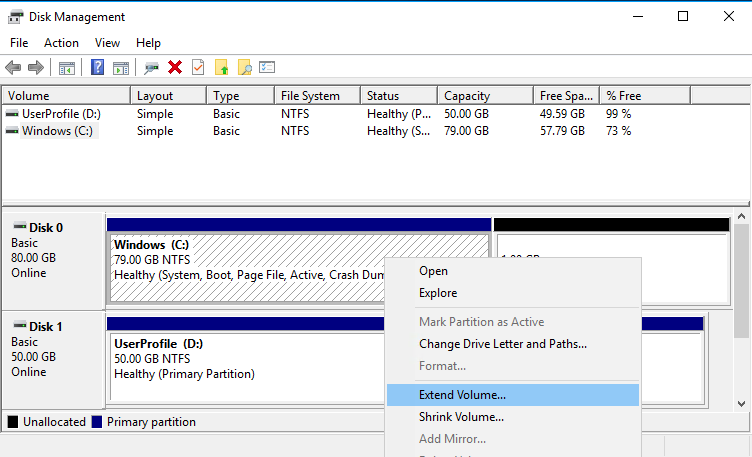 In this article, we are going to show how to resize HDD/SSD drive partitions keeping user and system data. Partition resizing is a common task if your hard drive needs to be replaced in any case (except failure) or you would like to reorganize stored data in a new way. Before any partition-related actions are taken, please backup all your data to the separate drive or another storage device. 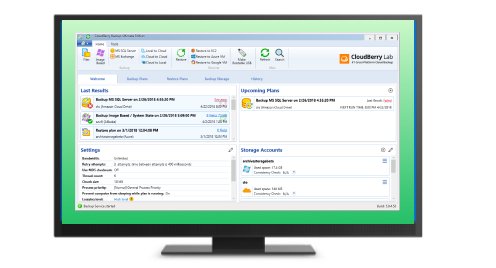 If you don’t have the right tool yet, you may download a FREE trial of CloudBerry software for Windows Server backup. Disk Management snap-in, that can help with almost every drive-related task you need. DiskPart tool, that can be accessed via command prompt. It has pretty much the same feature set, so we will focus on GUI. In this overview we are using Windows 10. Server partitions are resized in the same way with the same software. In all drive management tools you will face two terms: partitions and volumes. They mean pretty much the same thing - dedicated part of a drive to store user’s or system data. 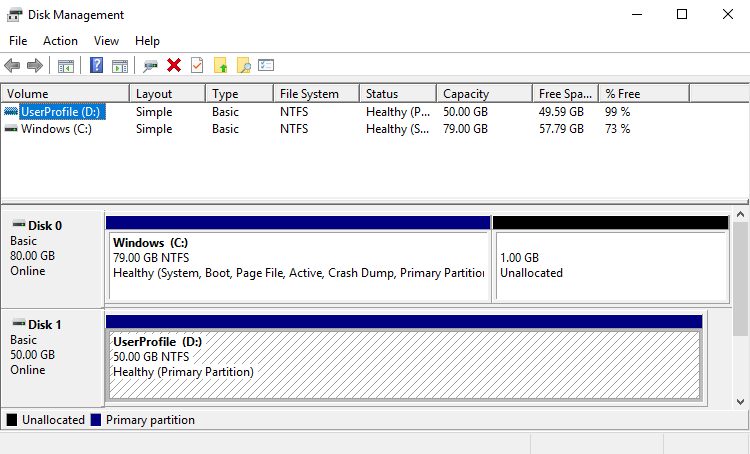 But partitions are related to unformatted drive sections, while volume is a layer with a file system (FAT32, NTFS, etc.) on top of it. 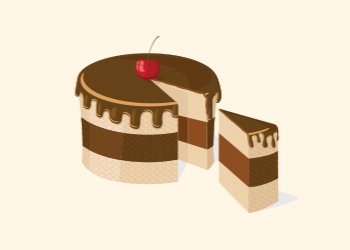 We will mostly use the “partition” term because the resizing action is more about bounds moving. Knowing that, let’s open the Disk Management tool by clicking Create and format drive partitions in the Control panel. Note: If you use the Server edition - open Server Manager and select Disk Management under Tools menu. You can only extend any partition to unallocated space of the same hard drive (on the picture - small black part, right to C volume). Free space can also be at the left of the current partition, but you can’t extend to it if running Basic volume type. Right-click current volume and select Extend Volume. Extend Volume Wizard will appear, click Next and proceed to the next step. Select unallocated space to extend on. You can select only part of the free space or get all free space by editing Select amount of space field. Review summary data on the next step and click Finish - your partition is now extended. 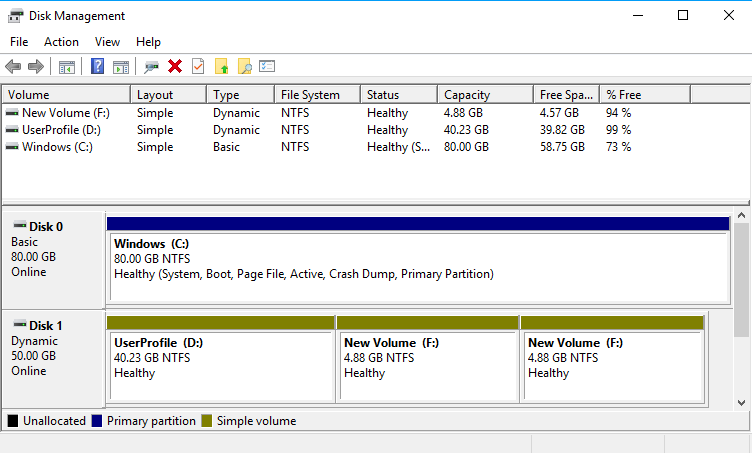 In case one of the partitions uses a much more space than actual data contained, you may want to shorten (shrink) this partition and use new free space for partitions with more dense placement. 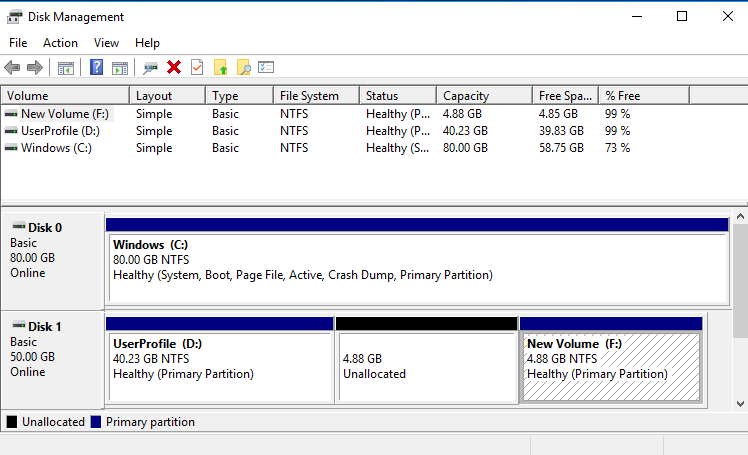 Shrinking is only possible for unused partition sizes. 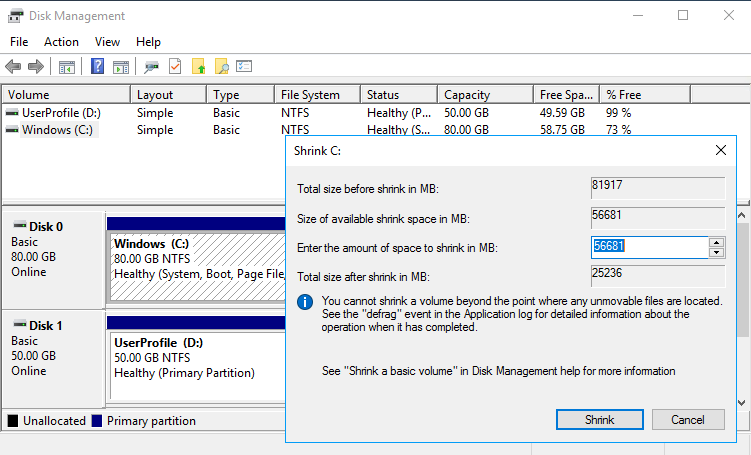 You can start a shrinking operation and check unused space by right-clicking on the current partition and selecting Shrink. On the picture above you may see that the “Size of available shrink space” is 56,681 MB. It is largest free space that we can get after shrinking is completed. 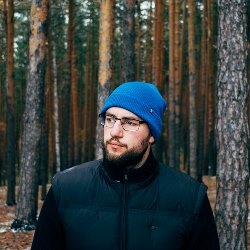 But keep in mind that the system partition requires some free space for normal operations - we suggest leaving free at least 20% of the current data size. Of course, this suggestion is not suitable for user volumes. Now enter the space you need to become reusable and click Shrink. Depending on volume’s data placement, shrinking can be completed momentarily or last some time. 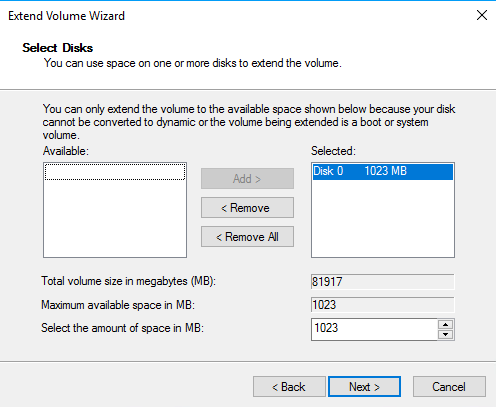 You can add newly created unused space to the current drive partitions or create a separate partition - the good way of separating system and user data. You may be confused about how to resize partition using free space at the start of such partition. It is possible using third-party tools, since data moving is necessary. This process is also time-consuming. Since the process depends on a particular tool - please check your third-party software manual for more info. If you are planning to extend volume “to the left” - it is not a problem, since Windows doesn’t need to reallocate already stored data. But during this operation all volumes on the same hard drive will be converted to “Dynamic” (it is called “Dynamic drive”). Note: Dynamic drives have advanced management features, but they have limited support by third-party disk management tools. If you are planning to use one of these tools in the future - please check whether it supports Dynamic drives or just uses Basic. Conversion Basic -> Dynamic is a one-way process, so be careful. Above you may see free space in the middle of hard drive - it can be used to extend F volume, but only after conversion of the entire drive to Dynamic. Windows marks Dynamic drives with a green color. Now you know more about how to resize partitions on the most popular platforms. Remember to create a backup copy each time when resizing or moving disk volumes. If you don’t have a suitable tool - you can use CloudBerry Backup for free with no limitations during a 15-day trial period. Don't hesitate to contact us if you have any remaining questions!